In wandering the local area last week in a bid to get to know our new home a little better, I was very happy to discover a well stocked greengrocers, butchers and bakery, all on one street and just a 10 minute walk from the house. It was a great find and popping inside to have a look around I was greeted with the wonderful colours and smells of fresh fruit, vegetables and fragrant herbs. I wanted to grab a whole load of ingredients right there and then and run (realistically walk) back home to cook something up. A little enthusiastic I know, but when your used to wandering through the supermarket isles where just about anything fresh has its aroma locked in by plastic, it was really rather nice and beyond that, it actually seemed to inspire the imagination and desire to cook something too. As it was, the only thing we needed were avocados, so my dream of filling my bag with colourful vegetables would have to wait. The next stop on this tour was the butchers where I learnt a very handy lesson…smaller shops will more than likely require that you carry actual, physical money (what is this magical thing you speak of!? ), or at the very least a hefty minimum payment for the pleasure of using your card. As it was, I had to bulk out my bacon purchase with more meat, making this part of the trip more than twice as expensive as planned. On the plus side, it will freeze, so I guess it can come off the future shopping bills. But bear that in mind when you make your first trip to the local shops and be more prepared than I was. It is a few days later now and I finally got to go back to the greengrocers with a shopping list to boot. Having organised a meal plan for the week, another tactic for reducing waste that has the added benefit of cutting costs too, I was looking forward to seeing what veg I could buy. I opted for vegetarian meals this week (minus the sneaky steak I had to purchase from the butchers last week) and I don’t want to stray too far from the waste free theme of the blog on this occasion but as the purpose of reducing waste, in particular plastics, is to help protect our environment, it has also dawned on us that reducing our meat intake should also be on the agenda. The reasons for which I will go into another time but in short, it is in recognition of the high carbon footprint associated with growing livestock and transporting meats. We already try to source our meats responsibly for ethical reasons, this is just another aspect to think about and in all honesty we have loved the new dishes we have tried. Back to the mission ahead, a.k.a operation grocery store, I decided to don a small hiking backpack that I used when travelling. It has the added bonus of waist support as I tend to suffer with a bad back, and of course it has the added bonus of being bright turquoise and extremely stylish…hmmmm. The shopping experience was pretty easy to be honest. I took a canvas bag with me so that I could stock up as I walked around and there were plenty of brown paper bags for any of the loose items. The owners were extremely helpful too, pointing me in the right direction and giving me snippets of advice. With smaller shops having to compete with the supermarkets (of which there is one only a few doors down) I imagine this is a huge reason why the service is so good. One thing I think will make this experience nice in the future is getting to know the shop owners a little more, it’s a lot more personal than a supermarket shop and although some might disagree with this, as a northerner, I tend to prefer some chit chat in my day. The selection and quality of the vegetables was great, in fact there was even more than a supermarket might have to offer and the best thing, barely any plastic! The only things I really saw in plastic was some nuts that were pre-packaged, some herbs that were in paper packets with a plastic window and some pre-packed spinach leaves. Finally I get to buy broccoli without a plastic film suffocating it! The only thing I would bear in mind for next time is that having another canvas bag would have been useful. As it was, the owners had to empty the bag I had stocked whilst walking around and then I had to wait for them to ring through every item before I could re-pack it again. It would have been far easier to have another bag to pack it all into but I know that now for next time. The only ingredients I bought elsewhere were white wine vinegar (which I now realise I could have bought from the grocers), some pine nuts and frozen peas. Here it is, naked fruit and veg! Having since done a price comparison with an average supermarket, I found that in ditching the plastic I paid an additional £2.59. With that in mind, it was definitely a little more expensive to shop at the green grocers, however, combining this with using meal plans and reducing our meat intake, it will probably work out cheaper than what we were originally spending and for myself, coming home with so much less plastic made it a price worth paying. 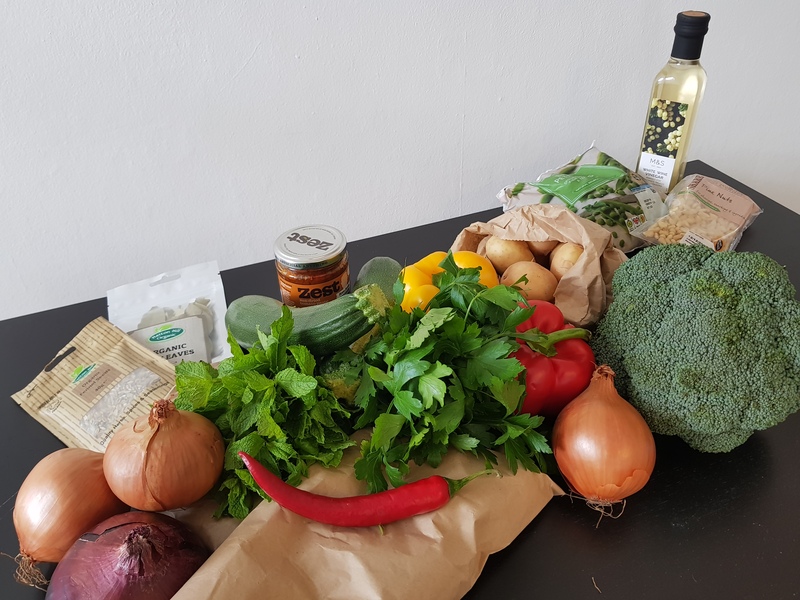 If the food budget is on a tight string, please don’t let this put you off, use online shopping to get estimates of costs using the supermarket and then investigate local options for fresh fruit and veg, you may find it much cheaper to shop locally if there is more than one option and especially if there is a market with more competition. It might not seem like the most interesting of days out, but make it into a little adventure; you might discover areas of your town/city that you didn’t know existed and in doing so be one step closer to minimising your waste.